Artful Affirmations: Tea Cup Tuesday and Giveaway! Tea Cup Tuesday and Giveaway! This is what I wish for each and everyone of you for this coming New Year. An Irish blessing I found at Irish Culture and Customs. Welcome to the last Tea Cup Tuesday of 2010! Next year will be here soon and we shall start a new year of sharing. Martha still has plenty of cups left to show us, and I still have a few...in fact, Santa brought me two more! Yea! I will share them another week. Today I want to thank my wonderful friend Martha for sharing this party with me and making it so special with her fabulous posts. Thank you Martha! Here is my my first tea cup and saucer for today. It is a subtle shade of blue, so pale, so gentle. It has a lovely iridescent finish inside. 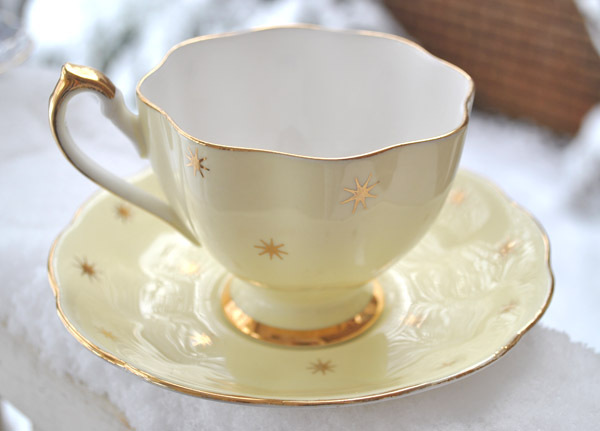 I love the stars, so perfect for a holiday cup, especially New Years eve. I think the stars give it a mystical look as well. The gold hand painted stars shine all around. It sits tall on it's gold trimmed pedestal. An interesting gold specked ring handle, with a slight thumb rest. I do not know who made this magical cup, the bottoms do not have any markings on them. Here is my second cup. It is a lovely shade of yellow, and it too has gold stars all around. The stars are similar but not the same as the first cup. I do love the ruffled edge of this cup. The plate has a scalloped edge as well. The golden handle is elegant with a larger thumb spur. Luckily this cup has a backstamp, and as you can see it was made by the Queen Anne China Co. This stamp is one they used between 1950 and 1958. Which makes this cup about my own age! Here is a look out my front door yesterday morning....very, very unusual for us here. We enjoyed looking out the window at the white wonder. Unfortunately two of our trees were badly damaged by the weight of the snow. They are not used to it. The sky itself was about the same color! Winter beauty is so magical. Just like my cups! The Love Banner is from my free video and the rest are all kinds of things to create with. 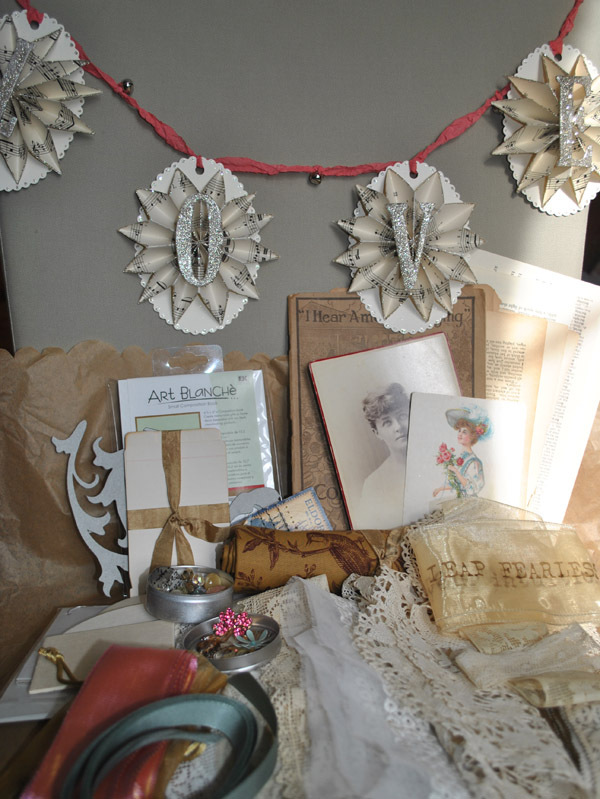 Lots of bits of vintage lace, beads and baubles. If you would like to share one or more of your tea cups with us, it's story, it's history if you know it....then fill in the two blanks below in Mr. Linky. Check the link yourself to make sure it works. We will love coming to see yours! 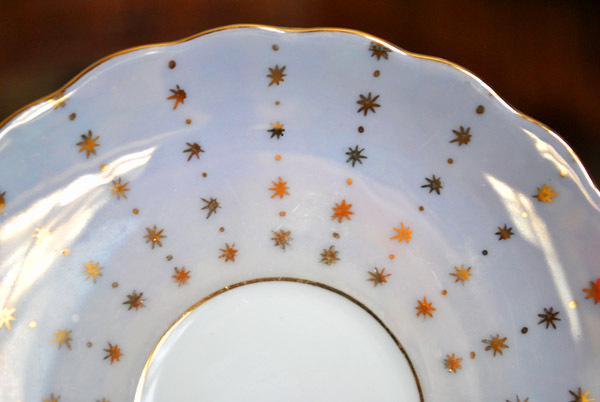 Your teacups are beautiful and love the star pattern! 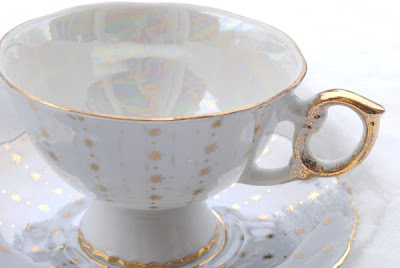 I'm not a teacup collector but do have some of my Great-Grandma's Jewel Tea. Beautiful tea cup!!!! The snow looks so wonderful and I remember how it looked when I was a child! Thank you so much for visiting my blog today and becoming a much appreciated follower! Have a wonderful New Years! Terri...yay...what a magical post..beautiful and so starry ...so me!! Lovely! !I so enjoyed this post! Happy Holidays and wishing you many magical blessings in the new year! These are wonderful teacups. That first cup has such a beautiful shape. The subtle color and gold stars are lovely. As you said, they are perfect for the holidays. 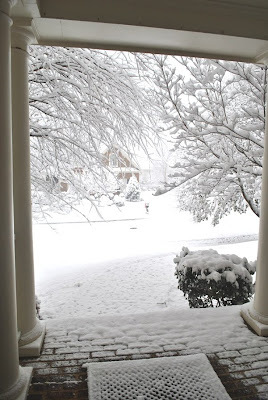 It was quite a treat to have a white Christmas here in GA.
Hi Terri! The tea cups are beautiful and your snow is lovely! I'm sorry it did some damage to your trees, though! I'm joining in Tea Cup Tuesday again today! Love all those starry cups!!!! Your winter photos are magical! Happy Tea Day! 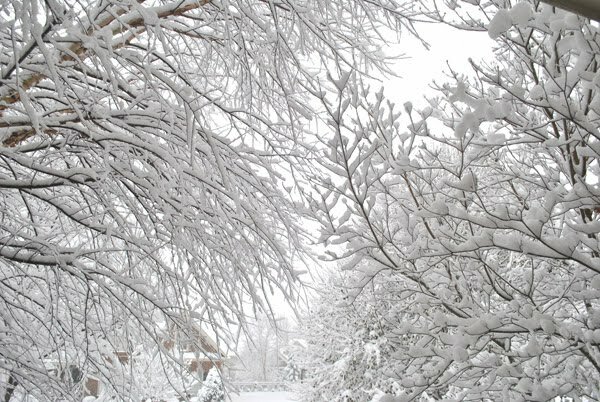 I'm so sorry your trees were damaged.. We got lots of snow too..
Terri, these are so elegant and dainty! I think I'm all out of teacups! :-( Think I need to buy more? I'm looking for ways to display them because I have several tucked away in a cupboard - this is not good! 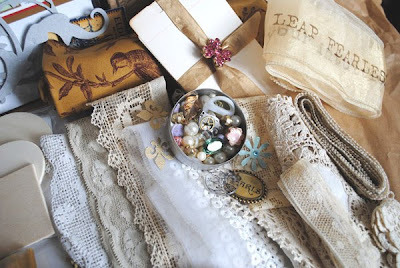 It's been such fun for me to share my teacups in 2010. When I acquire more...I'll be back! In the meantime, I'll be visiting! 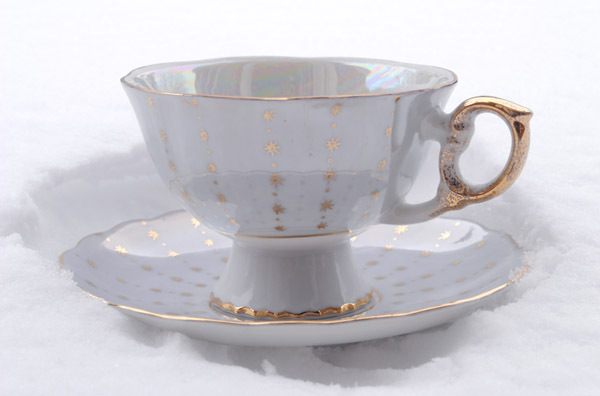 Hello Terry, what a beautiful starry teacups! And it must be special for you to have snow.We also had lots of snow lately in Paris it was beautiful, but a big mess for the traffic! 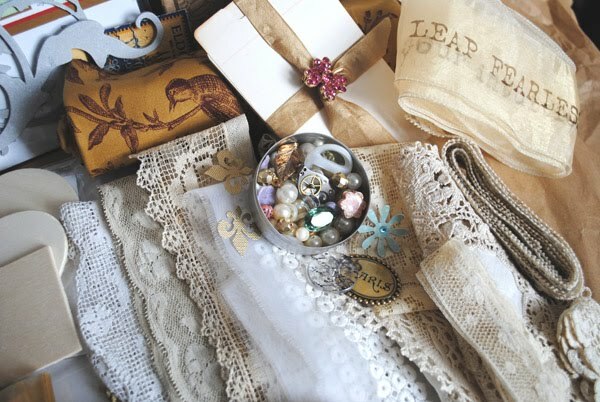 Your give away looks just gorgeous, I DREAM of it! HI! Thank you for this link-up! Snow and more snow, all white here in MN too. Glad I found your blog. It's lovely. Happy New Year! xo Jeanne. I hope you've had a special Christmas. All the very best for 2011! Terri, your tea cups are lovely. You photographed them beautifully. This is my first Tea Cup Tuesday and now I am inspired to unpack all my precious tea things that have been in storage for the past 2 years. Thanks for sharing and enjoy the snow. I'm sorry for the tree damage, however. God bless! Beautiful tea cups, Terri. I would love to see your collection all at once! Funny thing, you got the snow and we got nothing. It seemed to go around us and got all the other sides which is OK with me. Have a lovely evening, dear friend! Hugs and stay warm. Beautiful tea cups! I love how you photographed them the snow. 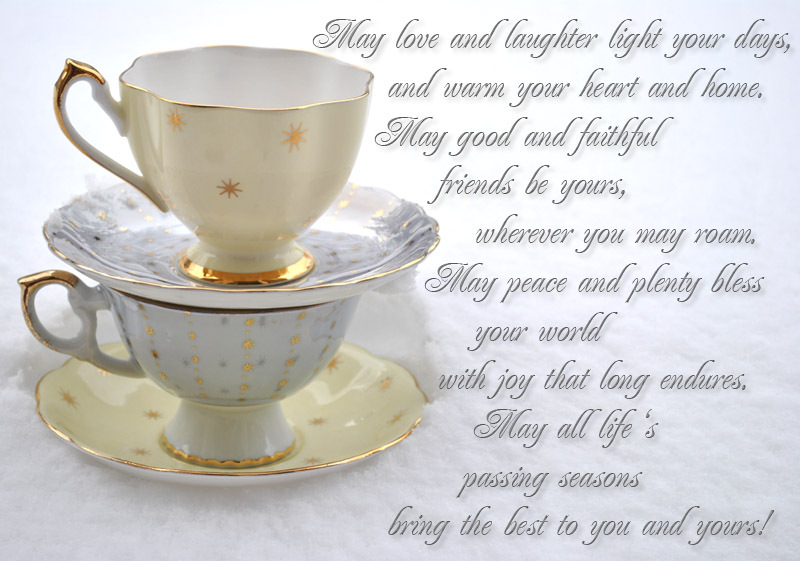 Thank you for stopping by for my holiday teacup. Love yours, very pretty and simple.The snow on the trees are pretty. Happy Holidays to you to and Happy New Year. Thank you so much for hosting! 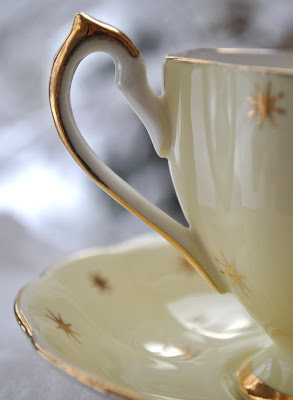 I have a soft spot for teacups too! The best is to have ones that mean something to you, isn't it! Terri! That is so lovely! I love all the Irish blessings - I think it is gorgeous how you placed it next to the beautiful teacups! A lovely post for that last Tea Cup Tuesday of 2010...but we have a new year waiting! 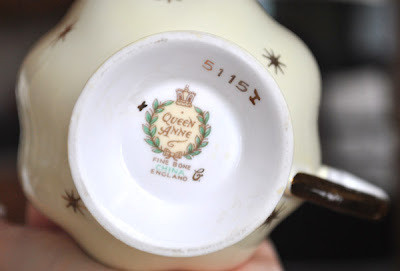 I love the teacups...Queen Anne is a favorite of mine. Thanks for visiting myfirst participation in Teacups Tuesday I was invited to! Such fun! Beautiful snow...now that I no longer live in snow country! I'd love to enter the drawing, although I never win anything! LOL! Hi Terri, as always, your teacups are pretty.. and unique of course! I really like your cups ~ sweet, simple and pretty! thanks for sharing and wishing you Happy New Year! Your teacups are simply beautiful. what a lovely post! I hope you are ok with all that snow! I hope you have a Happy New Year and that 2011 is full of many blessings! I can almost see those stars twinkling. So beautiful. I enjoyed looking through your blog. My dad sent tea cups home to my mom at the end of WWII. They all have prints on the bottom and I feel so lucky to have gotten them. TFS and thanks for stopping by my blog and leaving a comment. I love having tea sooo much !!! Your teacups are very beautiful and looking grand. Thank you very much for making this giveaway. Wishing you and everyone the best for New Year. This is such a beautiful magical giveaway. I am in awe. I really would so love to win. I don't really have any Valentine's Day type decorating things at all and everything in the giveaway would be cherished and loved. Thank you so much for doing such an incredible giveaway. So very beautiful. Reminds me of my great aunt home, she loved to display tea cups that she collected from all over the world. Thanks for the chance to win. Happy New Year and Giveaway Winner! 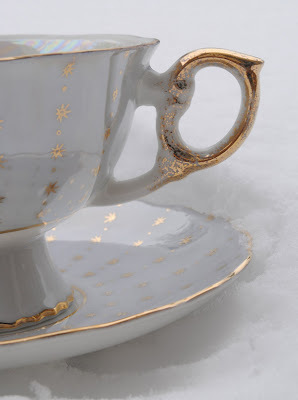 Merry Tea Cup Tuesday and Giveaway!